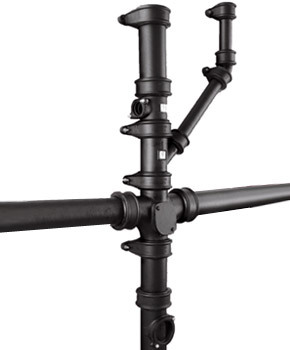 Mechanically jointed cast iron drainage system for above ground soil, waste and vent and internal rainwater systems. Diameter range: 50 to 150mm. Ductile iron two-part mechanical couplings. Pipes are manufactured using the De Lavaud process producing pipes with high mechanical and impact properties and easier to cut. Externally coated with a black alkyd paint. Internally - two-part epoxy lining, ochre in color. Internally and externally with a black water based paint. Proven high performance drainage system that has served the construction industry for over 40 years. Range of push-fit heritage sockets for traditional appearance. Pipes available in 1.8m lengths in 100 and 75mm to support traditional market. Ideal solution for external soil stacks. Excellent range of access fittings. Cast iron drainage systems to suit most gravity above ground applications for commercial, residential and public buildings all backed by third party certification.